This is probably one of the most successful designs in Beneteau's 127 year history. Yes, do the math – Benjamin Beneteau founded this company back in 1884. Through a constant evolution of luxury yacht design, they've taken the best parts from one of their flagship designs, the 473, and put them all into a more compact hull without sacrificing any of the benefits. How many yachts in this size range can boast three discrete private cabins including an owner's stateroom, two heads and a spacious main salon and galley, all unrivaled by the competition? This truly is an opportunity to buy a well-maintained yach that is practically brand new in every way, for a FRACTION of what a new one would cost. A new Beneteau with this eqiupmnet will run you upwards of $250,000. To help with your consideration of this yacht, I’m available to discuss any detail that interests you. Further, I have in my possession PDF copies of the original Beneteau 393 brochure as well as a recent owner’s survey from last fall, dated 9/10/2010. I can email both to you at a moment’s notice. If you have any questions at all about this yacht that I haven’t answered here, please feel free to contact me anytime 24/7. My goal is to SELL THIS BOAT. Designed for maximum comfort, the interior of this yacht lives like a much larger vessel. There are three huge staterooms, a generous main salon that utilizes the entire 13’-0” beam effectively with abundant storage everywhere. The navigation station integrates smoothly to port and the dinette with folding leafs and fiddles accommodates the whole crew at mealtime at anchor or underway. The longitudinal galley to starboard is large for a yacht of this size. It boasts Corian countertops, 12V refrigeration, built in microwave, dry storage, cubbies everywhere, and a double stainless steel sink. The fore and aft three sleeping cabins are so vast for a 39’ yacht. Use one of the aft staterooms when you need to romp a bit. Use the forward stateroom when you want cool breezes flowing over you at anchor. The satin varnished teak interior is sumptuous at the least and, as the photos clearly show, is in good condition. Opening ports and hatches are everywhere keeping the cabin both light and airy whenever you desire. Two heads serve owners and guests. Engine was replaced in 2012. 200 of her 435 hours were in the last two weeks on a light wind trip from Saint Thomas, USVI, to the Chesapeake. Designed by Groupe Finot, the Beneteau 393 offers a sophisticated contemporary hull with traditional lines. A spacious cockpit, top-of-the-line deck hardware and a roller furling main accent her ease of handling. Our tour begins in the cockpit, hopefully the place you’ll spend most of your time both underway and on the hook. 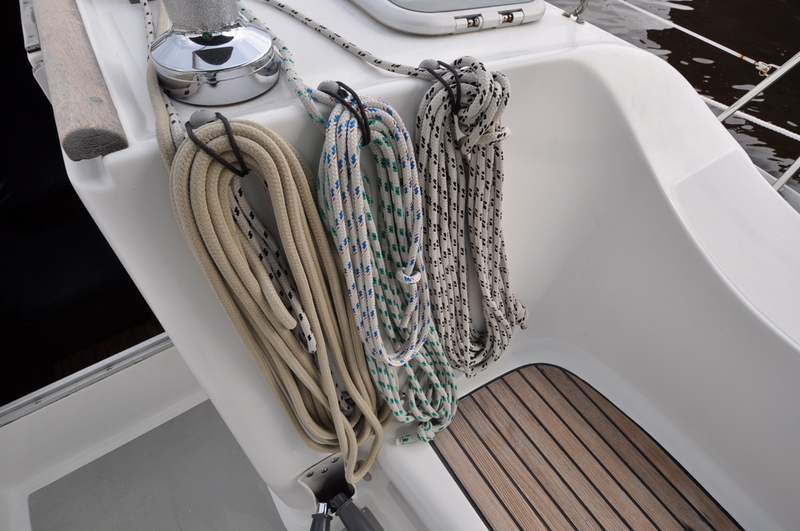 All lines lead aft from the rig, including the roller furling 140% genoa. Cockpit seating is inlaid varnished teak. The benches are long and deep for either lounging (a.k.a. SLEEPING for me) at anchor or working the rig on a spirited day of sailing or racing. The helm has an electronics & navigation pod with plenty of room for gear, compass and a built in cockpit table. The helm seat folds away for easy access to the stern swim platform. A hot/cold water cockpit shower fits under the helm seat. Departing the cockpit, the side decks are wide and easy to traverse. 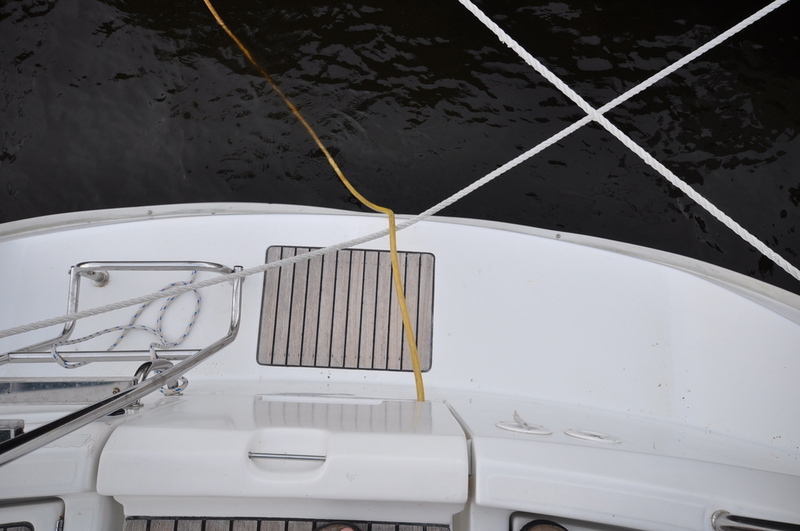 Stanchions, chain plates and all appropriate hardware are mounted in solid fiberglass to keep the decks dry for decades to come. The step up onto the coach roof is easy even for small children. 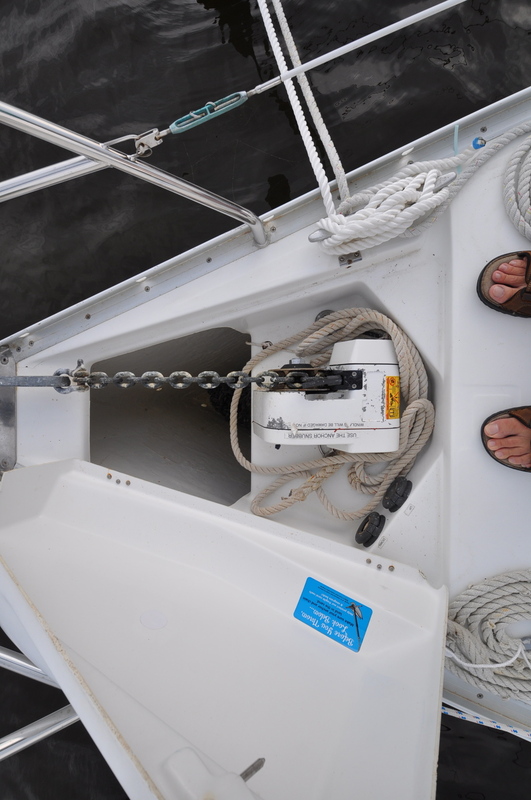 Up at the bow, an electric anchor windlass allows easy gunk holing. DECKS are DRY AS A BONE and solid underfoot. HULL: Solid GRP with molded inner structure and integral floors, reinforced with unidirectional rovings. DECK: Balsa sandwich construction for rigidity, sound and thermal insulation. Molded deck liner for insulation and ease of maintenance.